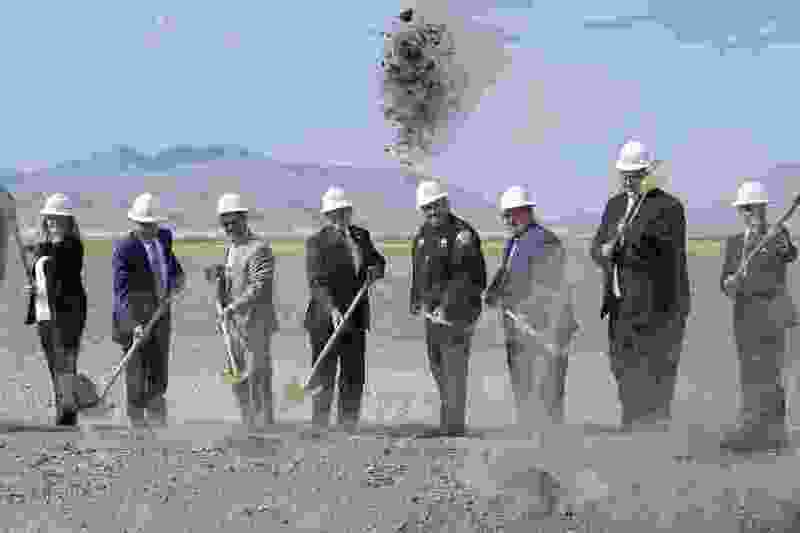 (Scott Sommerdorf | The Salt Lake Tribune) Utah Governor Gary Herbert, center, turns dirt along with other dignitaries at the site of the new prison, Wednesday, August 16, 2017. Rep. Brad Wilson, R-Layton, is left of the Governor, and Utah Dept. of Corrections Executive Director Rollin Cook is to the right. The new prison under construction in western Salt Lake City will be more expensive, smaller and will open later than planned. The replacement for the current prison in Draper was supposed to cost $650 million. 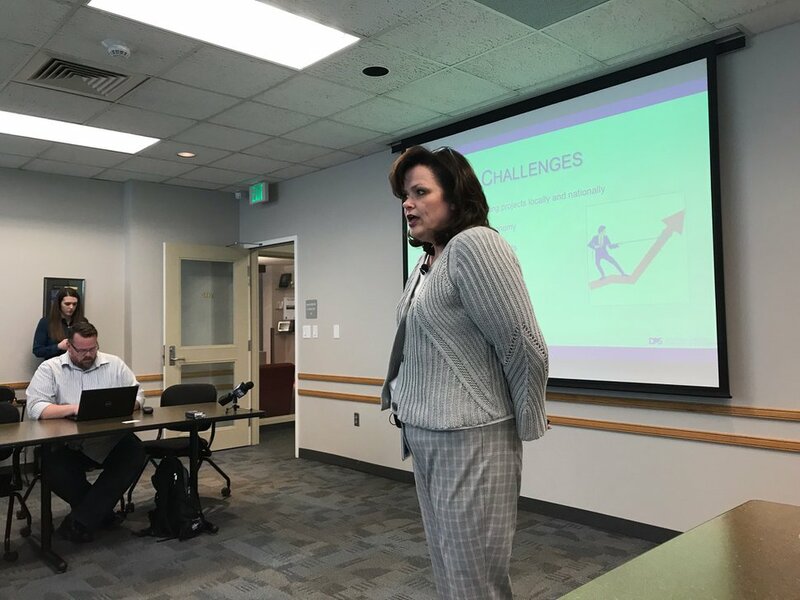 But it’s on pace to run 18% to 22% more than that, due in part to higher than expected costs for labor and materials, Marilee Richins, deputy director of the Utah Department of Administrative Services, said at a Friday briefing for reporters. The extra $130 million or so has implications for inmates. To control costs, the new prison will have 3,600 beds instead of the 4,000 that had been planned. The new prison frequently has been described as “state of the art.” On Friday, Richins revised that description to say certain components will be state of the art. (Nate Carlisle/The Salt Lake Tribune) Marilee Richins gives a presentation April 5, 2019, on the costs and changes at the new Utah prison west of Salt Lake City. Budgeted to cost $650 million, the project is on pace to exceed that by 18 to 22 percent and will open later than anticipated, she said. Construction is also behind schedule. Inmates will start moving from the Draper prison in January 2022 — up to 18 months later than earlier plans. In explaining the higher price tag for the prison, Richins cited the strong economy and other construction projects — including the expansion of Salt Lake City International Airport — which are consuming labor and materials. Steel tariffs imposed by the Trump administration also are increasing the expense of the project, she said. The higher tab isn’t totally unexpected. When a commission began looking at moving the state’s prison from Draper to Salt Lake City, the estimated cost was $860 million. That number was whittled down in part by deciding to make the new prison smaller than the one in Draper, and $650 million was the figure used during debates in the Utah Legislature. Richins did offer some good news Friday. Some of the infrastructure work being completed now is millions of dollars less expensive than estimated, including soil work and the installation of water and sewer lines. Project managers also have decided to save $10 million by letting current inmates construct furniture and signs for the new prison. Still, Richins said, the project will need more money than the Utah Legislature has provided. She gave two options. Either legislators can appropriate more money, or the Department of Administrative Services, which oversees many of state government’s construction projects, can issue bonds — the government version of taking out a loan — to cover the excess costs. Richins said legislators were briefed on the cost increases and changes during the general session that ended last month. The new prison has had the support of the Utah Prisoner Advocate Network (UPAN), which works on behalf of inmates and their families. UPAN spokesman Shane Severson said Friday that the group had been told earlier about the reduction in the number of beds. Severson said the classrooms, dormitory-style housing and aesthetics of the new prison will make it a more therapeutic place for inmates than the Draper facility. Shaving 400 beds off the new prison will save $50 million, according to Richins’ presentation. To house the remaining inmates, she said, the state will have to send them to county jails or find alternatives to incarceration. Richins suggested, for example, that inmates with Alzheimer’s disease might not be housed at the new prison. The Utah Department of Corrections, which will operate the completed new prison, will have to find beds quickly. Earlier projections said the new prison would need to house 4,000 inmates by 2022 — the year that the new lockup is now scheduled to open. The Draper prison had 3,534 inmates on Friday, according to a spokeswoman for the Utah Department of Corrections. A Feb. 1 report from the department warned that the prison population was increasing. That’s despite the Legislature in recent years reducing the penalties of some offenses, particularly drug crimes. Correction: Correction added at 3:13 p.m. on April 5, 2019: Richins does not expect the number of beds in dormitory-style housing to be reduced.